If you're the admin for Microsoft Teams in your organization, you're in the right place. When you're ready to get going with Teams, start with How to roll out Teams. If you're new to Teams and want to learn more, read on. Don't miss org-wide teams, a special type of team that pulls in every user in your organization and keeps membership up to date with Active Directory as users join and leave the organization. To customize and extend Teams, add third-party apps through apps, bots, & connectors. With Teams, you can include people from outside your organization by adding them as a guest to a team or channel. As part of Office 365, Teams offers a robust development platform so you can build the teamwork hub you need for your organization. To stay on top of what’s coming for Teams and all other Office 365 products and services in your organization, be sure to check Message center and the Teams roadmap. You’ll get announcements about new and updated features, planned changes, and issues to help keep you informed and prepared. If you’re running Skype for Business and are ready to upgrade to Teams, or if you’re running Skype for Business and Teams side-by-side and are ready to fully move to Teams, we have the tools, tips, and guidance to help make your transition successful. To learn more, see Upgrade to Teams. When deciding which Office 365 apps and services to use, think about the work your organization does and the types of conversations your teams need to have. Teams, as the hub for teamwork, is where people - including people outside your organization - can actively connect and collaborate in real time to get things done. Have a conversation right where the work is happening, whether coauthoring a document, having a meeting, or working together in other apps and services. Teams is the place to have informal chats, iterate quickly on a project, work with team files, and collaborate on shared deliverables. Yammer to connect people across the organization. Drive company-wide initiatives, share best practices, and build communities around common topics of interest or areas or practice. Crowdsource ideas to foster open discussions with people across the company. See Known issues for Microsoft Teams. 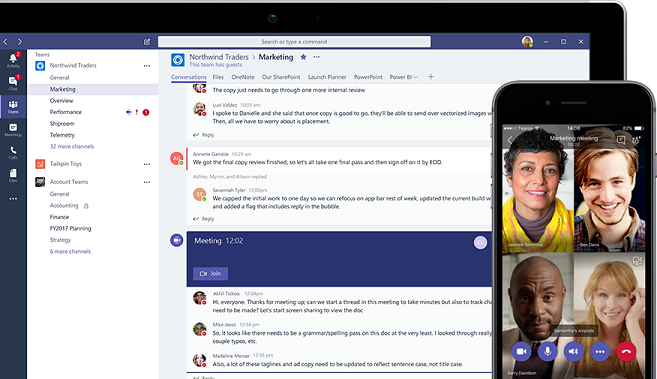 See What's new in Microsoft Teams.